G99 – Interfaces should avoid placing the secondary target within 50mm of the center of the primary target for thumb-anchored selections. Interfaces should avoid placing the secondary target within 50mm of the center of the primary target for thumb-anchored selections. In the multi-target selection, in the case the selection of primary target with thumb (thumb-anchored) never places the secondary target within 50mm of the center of the primary target, for a correct selection of the menu items. Example of a menu thumb-anchored with secondary target placed outside of 50mm of the center of the primary target. Interaction, Layout, Multi-target selection, Multi-touch. G98 – Interfaces should avoid placing the secondary target outside of a 100mm radius from the primary target, unless anchoring with thumb. Interfaces should avoid placing the secondary target outside of a 100mm radius from the primary target, unless anchoring with thumb. In the multi-target selection, in the case of the selection of the primary target with the index finger (index-anchored) the secondary target should be avoid placing outside of a 100mm radius, for a correct selection of the menu items. When is used the selection of primary target with the thumb (thumb-anchored) this value can be slightly increased. Example of a menu index-anchored with secondary target placed inside of 100mm radius and selectable areas. 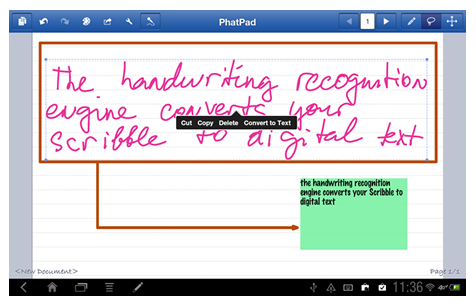 Interaction, Layout, Multi-target selection, Multi-Touch, Overlap. G97 – Interfaces should avoid placing the secondary target directly above the primary target for index-anchored selections, and below the primary target for thumb-anchored selections. Guideline: Interfaces should avoid placing the secondary target directly above the primary target for index-anchored selections, and below the primary target for thumb-anchored selections. In the multi-target selection, in the case of the primary target selection with the index finger (index-anchored) the secondary target should be avoid placing directly above. When is used the selection of primary target with the thumb (thumb-anchored) the secondary target should be avoid placing below. These recommendations are important due to wrist limitations. Examples of correct placement of menu using index finger (index-anchored), using thum (thumb-anchored) and selectable areas. G96 – Interfaces can use either the index finger (index-anchored) or the thumb (thumb-anchored) to select the primary target; there are no performance differences. 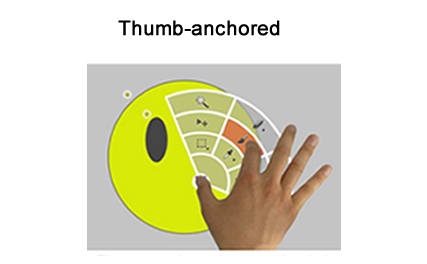 Interfaces can use either the index finger (index-anchored) or the thumb (thumb-anchored) to select the primary target; there are no performance differences. In the multi-target selection, the selection of primary target can be done by the index finger (index-anchored) or by thumb (thumb-anchored). There are no performance differences. Examples of use of index finger (index-anchored) and use of thumb (thumb-anchored). G95 – Interfaces should take the trade-off between the speed and accuracy into account: Simultaneous can be faster but more error-prone while sequential is slower but less error-prone. Interfaces should take the trade-off between the speed and accuracy into account: simultaneous can be faster but more error-prone while sequential is slower but less error-prone. In the multi-target selection two selection techniques can be explored, namely sequential and simultaneous techniques. 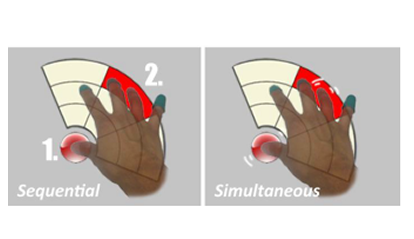 Sequential Technique uses the thumb or index finger to select the primary target followed by another finger to select secondary target (seven finger combinations in total, thumb with index, middle, ring, or pinky; and index with middle, ring, or pinky). Simultaneous Technique uses the thumb or index finger to select the primary target and another finger to select secondary target at the same time ( also seven finger combinations in total). The main difference between these techniques is that simultaneous technique can be faster but more error-prone while sequential is slower but less error-prone. These examples illustrate the use of sequential and simultaneous technique.